Heat 1 teaspoon oil in large nonstick skillet over medium heat. Add mushrooms, onion, and garlic; cook and stir 10 minutes or until mushrooms have released most of their juices. Remove from heat; cool slightly. Combine mushroom mixture, tofu, oats, walnuts, egg, salt, onion powder, and thyme in food processor or blender; process until combined. (Some tofu pieces may remain). Shape mixture into 6 (1/3-cup) patties. Heat 1 teaspoon oil in same skillet over medium-low heat. Working in batches, cook patties 5 minutes per side. Repeat with remaining oil and patties. 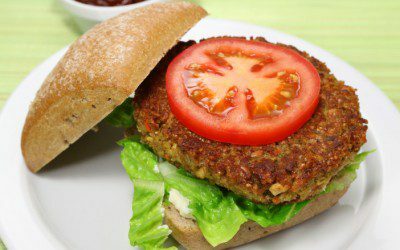 Serve burgers on English muffins with lettuce, tomato, and onion, if desired. Garnish with cucumber spears. Exchanges per serving: 2 1/2 bread/starch, 1 fat, 1 meat.